Q: What are the qualifications for becoming a volunteer? A: Volunteers are the heart of our program. We encourage anyone 16 years and older that has a good ear for listening, is kind, compassionate and empathic to consider volunteering. Our volunteers come to us with a variety of background and life experiences. They are business professionals, homemakers, teachers, students, mental health professionals and retirees. Q: Do I automatically get to volunteer once I complete the training? A: Not necessarily. While 99% of those who take the training go on to become active volunteers, occasionally it turns out that trainees are not a good fit for our program. The training is a time for the staff and trainees to evaluate this fit. Don’t worry, training is not a “test,” but it is a great time to see if our model is one that you are comfortable with. We also do a criminal background check that needs to be cleared before you can volunteer. Q. Do I need to complete all the days of the training? What if I have to leave early? A. Sorry, all days of the training must be completed. Each training day is packed full of important skills and the information necessary to facilitate our groups. Each day’s learned skill set is designed to build upon skills for the next day. Q: How will I be placed in a group? A: The first basis for placement is where we have needs in terms of days and type of group. We also try to incorporate your personal preferences in terms of which age you’d like to work with, but cannot guarantee that a spot with your age preference will be available. We hope that volunteers will be flexible and open to contributing in a way that best meets the needs of our groups and families. Q: When do the groups meet? A: Groups meet Monday through Thursday in the evenings. We typically follow a school schedule, so we do not meet during the public school’s spring break or the two weeks of the end of year holidays. We also do not meet during the 8 weeks over summer once school is out. Q: Why are groups 3.5 hours? A: The groups are split into three parts: a half hour long pre-meeting for volunteers and the staff Coordinator, 1.5 hour long session for the children & families, and then an hour long post-meeting for volunteers and staff. Our pre-meetings and post-meetings are an integral part of the volunteer requirements. Our pre-meeting is a time to reflect upon the day and to gain any pertinent information about the group. The post-meeting is a way for the volunteers to convene and reflect upon the group. The post-meeting is critical to self-care. Q: As a volunteer will I be running a group? A: As a volunteer, you’ll work under the direct supervision of a staff Coordinator. In the groups for children and teens, the Coordinator will be part of your group. If you become a facilitator in one of the concurrent adult groups, you’ll work with one other experienced volunteer. You’ll also have supervision from your Coordinator during pre and post-meetings. Q: Can I miss a group? A: Yes, we understand that life happens and occasionally volunteers need to miss due to illness, vacation, work, etc. With that in mind, we do ask that when you agree to a group time/day, it be one you a) can make a sustainable commitment to, and b) will make it a priority to attend on a consistent basis. If you begin to miss more than occasionally, your Coordinator will talk with you about finding another day/time that works better with your schedule. 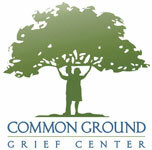 Q: Who attends the Common Ground Grief Center Groups? A: Common Ground Grief Center is open to children and teens ages 6-18 who have experienced the death of a parent, primary caregiver, sibling or friend. While the children and teens meet in their groups, there are also groups for the adults who bring them to the program. We do not have groups for adults who are not bringing a child or teen to the program. Q: Do you provide therapy? A: We are a peer support program and follow the peer support model pioneered by The Dougy Center. This means we provide opportunities for children, teens and adult family members to meet with others their own age who are also grieving the death of someone in their lives. As a volunteer, you’ll use the facilitation skills we teach you in training to help create safe, accepting, and welcoming group experiences for all participants.